I’ve read a number or news articles and watched a number of online videos relating to Flight 1549 and there seem to be one element of concern relating to the way in which the evacuation was conducted; It appears that many passengers, contrary to crew member instructions, took the “woman and children first” approach. It’s actually quite admirable that many passengers put the needs and welfare of others above their own, but it’s simply not the way in which evacuations were designed to function. It seems that the crew on board the aircraft had a hard time overpowering the passengers’ ingrained sense of need to do what they believed to be the right thing. Even thought the evacuation was conducted rather quickly, vacating the aircraft in the order that the cabin crew instruct is usually the easiest way of emptying the aircraft in minimal time. In virtually every interview I have watched in the aftermath of Flight 1549 passengers generally express an admirable women and children sentiment without apparent knowledge that it probably compromised broader safety and likely increased the time to evacuate the vessel. That said, it’s not something that cabin crew make overly clear in any briefing on the ground, but instead reserve those instructions in the unlikely event the actual need arises. 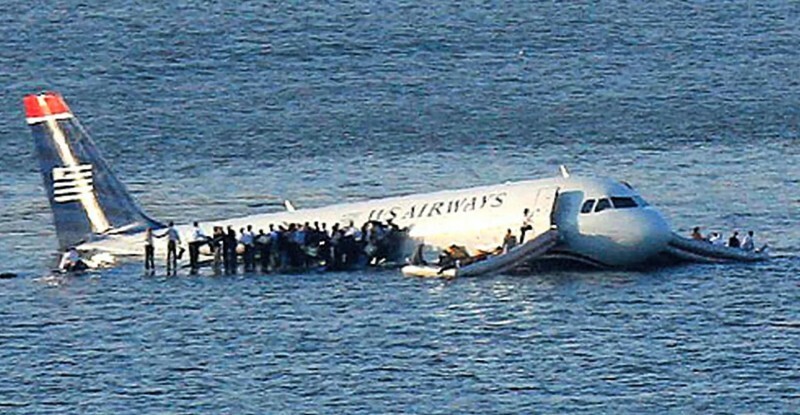 Could Flight 1549 have opened up a can of worms? Can we now expect airlines worldwide to adopt revised briefings on the ground to reinforce the perceived selfish method of egress? In the same way they tell us to put own oxygen masks on before helping others, maybe they should now also include information relating to the need to vacate the aircraft in the order of assigned seating. There was a recent news article on news.com.au that discussed research into the statistical survival rate of passengers on the Titanic, based on nationality. The findings on the report reflect a human desire to stand aside for others, citing in general terms, that being an “English Gentleman” was one reason why they were overrepresented in fatalities. It’s suggested that while the Brits happily bowed their hats and waved other passengers in front of them the Yanks swarmed the lifeboats like Oprah to a piece of cheese. The report by Australian and Swiss researchers found that although Americans only made up a fifth of those on board – they had a 15% better chance of survival than the English. They cite a range of reasons, including the socially aware nature of the English, and the fact that the Brits were more “maritime-aware” than their American counterparts. There are two maritime adages enshrined in history and form part of common language. One is “women and children first”, and the second is “every man for himself”. It’s suggested that the Yanks chose the latter. The study, not surprisingly, determined that women and children had a better chance of survival. What would you do if the order of evacuation was an option? It appears that the passengers’ on Flight 1549 shared the same altruistic approach as those on board the Titanic – and the same unselfish act likely prevails in other cases of tragedy as well. The study also revealed, unsurprisingly, that women and children had a greater chance of survival. Women were up to 54 per cent more likely to have escaped the tragedy than men, and those aged under 15 were 32 per cent more likely to have lived than the over-50s. Darwin’s ‘survival of the fittest’ doesn’t quite apply; instead it is the fittest that facilitate the survival of the weaker. Would a greater number of people survived the Titanic if the evacuation were better managed? As much as we would like to let politeness dictate the terms of an aircraft evacuation – there simply isn’t time. It’s important for people to operate towards a common goal and function to achieve the same end – and the only way of attaining this result is by surrendering yourself to the instructions issued by cabin crew. I’ve read a few blogs where people have discussed the same “women and children first” sentiment but it appears more of a feministic debate than anything else. To these people – I think you’ve missed the point (at least as it applies in an aircraft). It’s not a debate on social behavior or political correctness – it’s an issue of safety. I can see how people would want to engage in the discussions of chivalry, feminism and what not, but these same people seem to be blissfully unaware that in the controlled chaos of an aviation emergency, acting in a fashion contrary to the instructions of cabin crew can cost lives. Passengers play an important part in Crew Resource Management and can often be of tremendous relief to crew in times of a high workload, but they aren’t trained to make decisions. They should follow instructions – not give them.